British tabloid ‘The Sun’ has branded Taoiseach Leo Varadkar an ‘EU Toady’ following his latest comments on Brexit. The newspaper – which will be seen by an average 1.6m readers today – features Varadkar’s image under ‘Fury at EU Toady’. 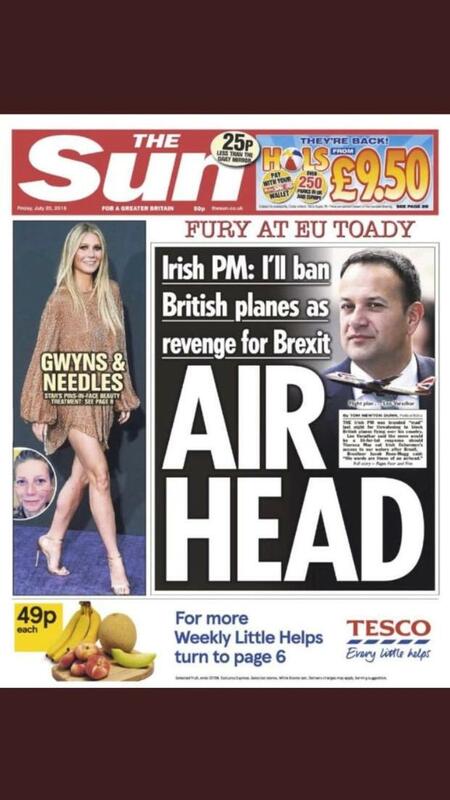 The headline reads: ‘Irish PM: I’ll ban British planes as revenge for Brexit’, followed by the line ‘Air Head’. The text reads: “Liability Leo. IRISH Prime Minister Leo Varadkar is a bigmouth and a fool, but his latest bone-headed outburst has done us all a favour. It accuses the Taoiseach of ‘brainlessly’ lobbing grenades to help Brussels in the negotiations. “Varadkar must believe that these grenades he brainlessly lobs into the Brexit negotiations help Brussels. He is not bright enough to realise how absurd and unstatesmanlike he looks,” the editorial adds. On Wednesday, Mr Varadkar said the Government has made a lot of preparations in case “the proverbial hits the fan” from the “shock” of a “disorderly Brexit”. This is not the first time the Sun has taken aim at Mr Varadkar – in another editorial last November, they told him “shut your gob and grow up”. They have also accused him of “mudslinging”, warning he will only have himself to blame if Ireland gets a bad Brexit deal. The latest war of words comes as the EU, the UK government and the IMF issued three separate warnings about the potential fall-out from a ‘no-deal’ Brexit.